After five days of being on a fat-free diet, I am finally allowed to eat "normal" food! In fact, I am getting ready to feast on some English muffins slathered with butter (the light kind, though). * Attacks may occur every few days, weeks, or months; they may even be separated by years. * The pain usually starts within 30 minutes after a fatty or greasy meal. * The pain is usually severe, dull, and constant, and can last from one to five hours. * It may radiate to the right shoulder or back. * It occurs frequently at night and may awaken the person from sleep. * The pain may make the person want to move around to seek relief, but many patients prefer to lay still and wait for the attack to subside. 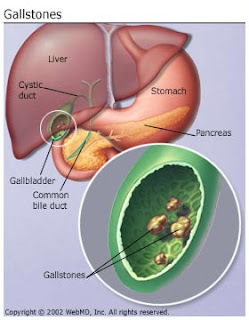 So now I have two things to "worry" about - that hepatic mass thingy on my liver and the gallstone. I will not think about it until I get to talk to the doctor tomorrow. Tonight, I am going to enjoy a nice bulalo (beef shank soup) dinner with friends after work. To be honest, though, I kinda enjoy this low fat diet thing. We went to the supermarket yesterday and you might find it hard to believe but I bought only a handful of meat and went home with tons of fish and fruits! Maybe I'll keep it up. You poor thing. It's hard without fat. I stopped eating fattening foods a few years ago. I don't even know why...I can at least give this bit of encouragement--at some point, you get used to it and don't want to change back! Its very hard to live on a completely FAT FREE diet, but maybe you should stick with cutting back as it will make you feel so much better! and I hope you hear good news at the doctor's visit!! !